DIY PID Control for BBQ, Sous Vide, Mash Tun, whatever…. 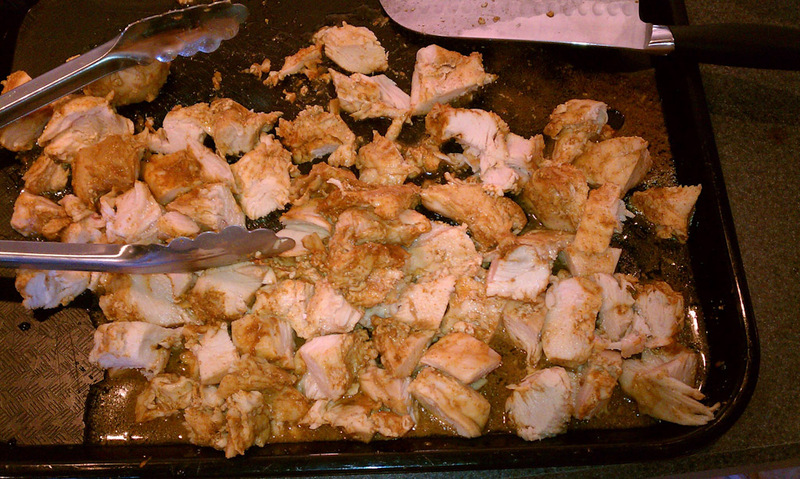 I’ve been slacking on the blog, I know, been busy! Here’s a project that’s been in the works for a while, and I wanted to test it out to make sure it works well before sharing with everyone.. well, here it is! 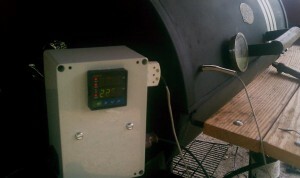 A DIY PID controller for a smoker, sous vide cooking, mash tun, whatever you can think of, that doesn’t break the bank. 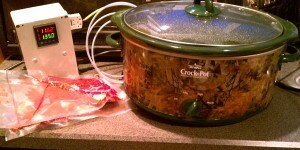 After a few runs in the smoker and sous vide (a la crockpot), I can say, it’s awesome !!!! What is PID? Basically you tell it what temperature you want something, and it figures out how to hold that temperature. It’s nerdy and involves lots of math. I can’t explain it too well, so go and read about it here. When I set out to build this, I wanted to keep costs down (obviously), but I wanted it to be versatile, so I decided to build everything with modular plugs, so that thermocouples and outputs could be swapped in a matter of seconds. 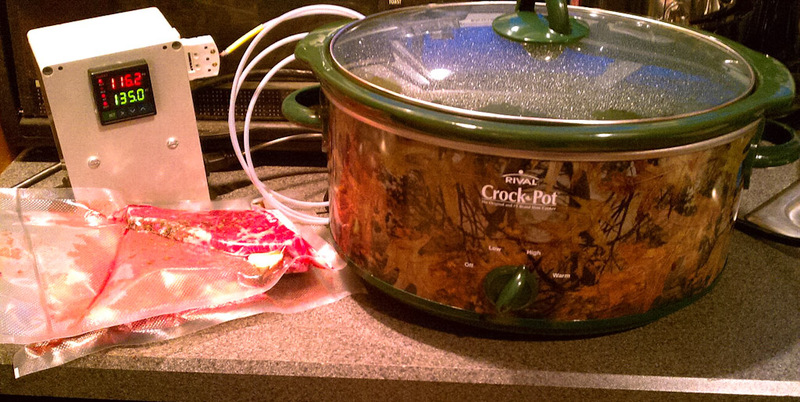 Everything fits into a project box, and all you do is plug in power (input), a thermocouple (thermometer for you noobs), and then plug in an output device, whether it is a blower fan, a crock pot, a heating element, whatever. All of the components in my design are good for 15 amps, so a ~1500 watt heating element should be no issue. 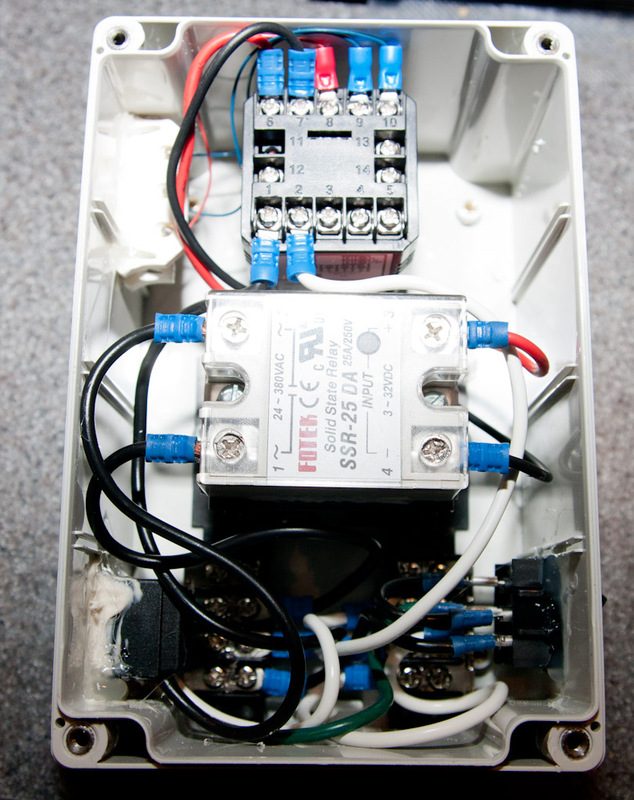 Wiring is simple and contained completely within the project box. I chose to do a simple design for the first incarnation of this device, but I have some ideas for another one. 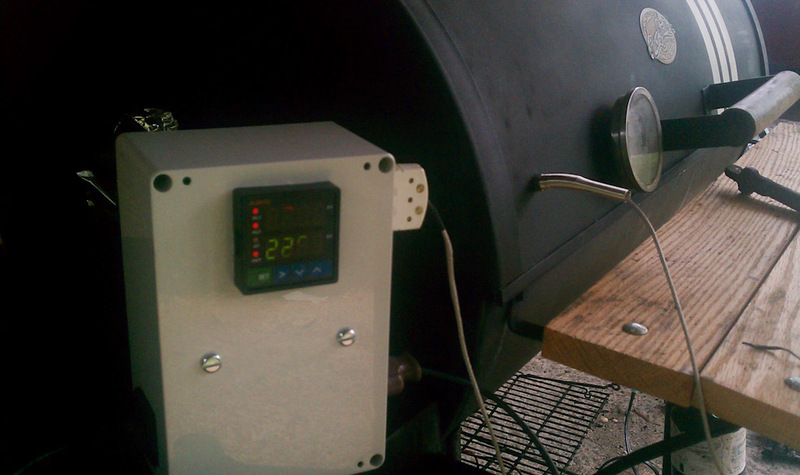 The PID controller has alarm outputs (such as over/under temperature) that could potentially control other items, such as a damper to release extra heat in the smoker, outputs to my X10 devices to page me, etc… the possibilities are endless. 1x HM928-ND project box – $17.82 US – Digikey’s site is very easy to search, if you need a bigger box, then look around – just make sure the dimensions are deep enough for all of your components. For 120v – the hot side of the input module goes through the switch and feeds a barrier strip. 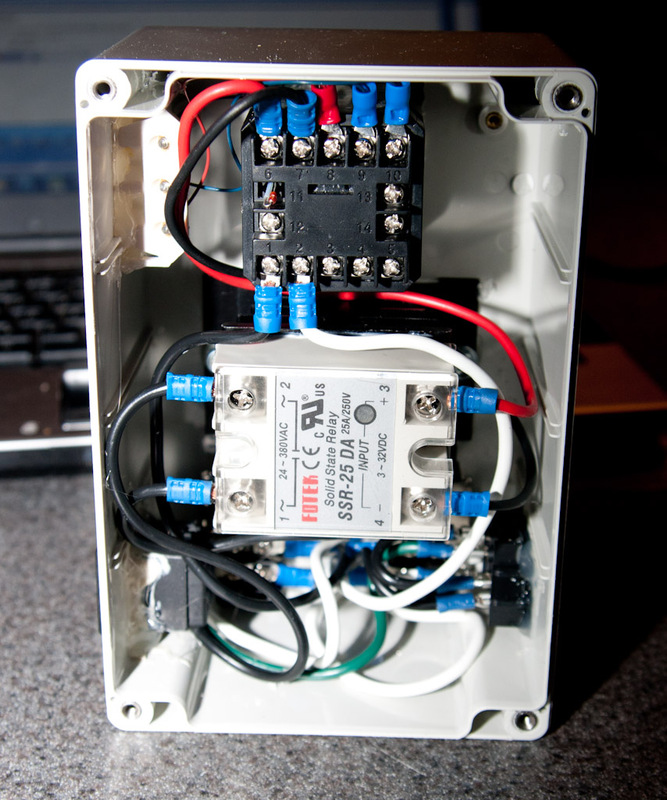 One barrier strip output goes to the output side of the SSR, the other output goes to the PID controller on pin #1. SSR Output goes to the output module hot. The neutral side of the input module feeds a barrier strip. One barrier strip output goes to the neutral of the output module, the other goes to the PID controller on pin #2. The ground wire goes directly from the input module ground, to the output module ground. Mounting components was simple. The input module, output module, PID controller, and thermocouple plug all require some dremel work to make mounting holes, then they snap into place. I used some hot glue for added security. My input is on the right in the picture above, the output and thermocouple is on the left. The heatsink mounts to the project box with screws, those are the 2 screws that you see on the first picture of this post that show through the front. I did not want to use glue for this part, as this part gets hot, I don’t need it coming loose inside. 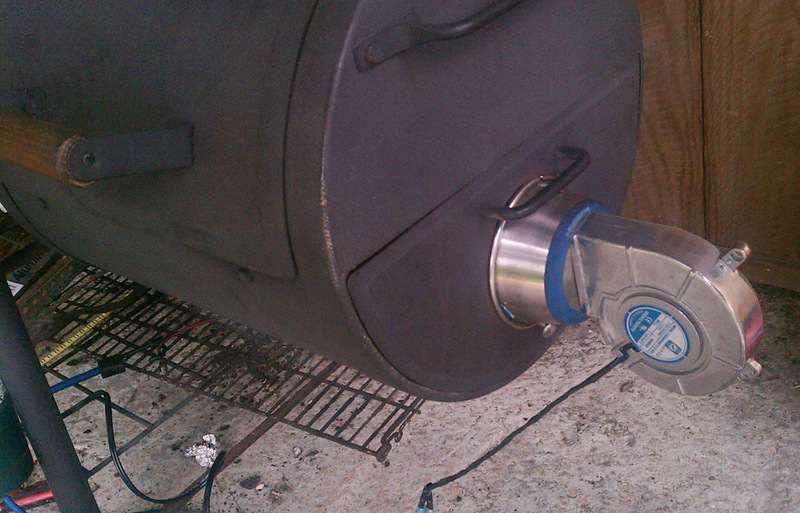 When mounting the Thermocouple in your smoker, you want it as close to the cooking surface as possible, and also nearest to any potential hotspot. 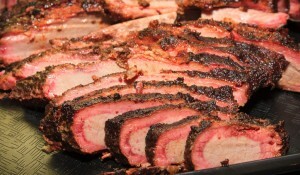 Remember, with smoking, high temperature is bad and will ruin food, low temperature only extends cooking times. On my Chargriller Smokin’ Pro, this meant the thermocouple was mounted about an inch off of the cooking surface, on the right side of the cooking area, nearest to the side fire box. My smoker can vary temperatures up to 15 degrees from side to side. The PID settings are set through the AutoLearn function of the JLD612. As for usage of the device, it’s too easy. 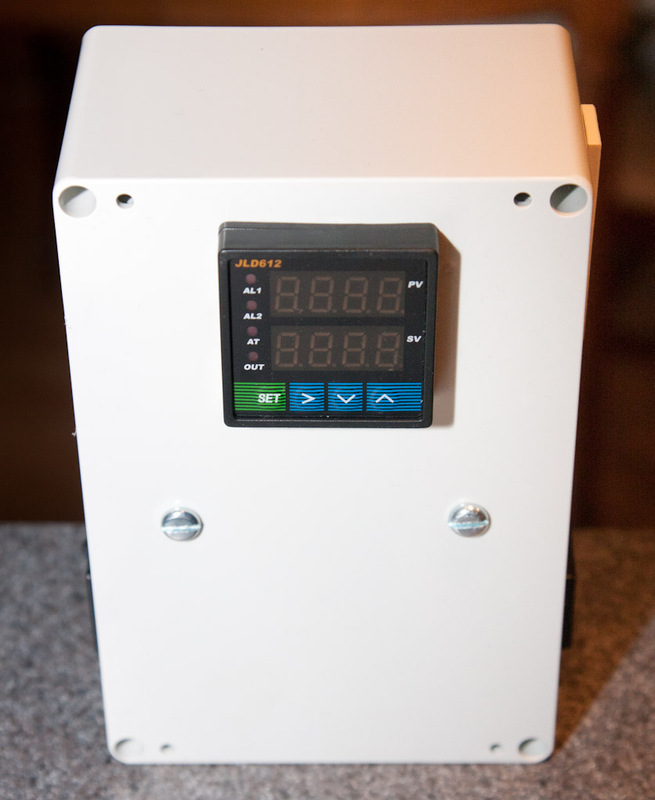 For me, every time I fire up the BBQ or Sous Vide, I put in my set temperature, and kick off the autolearn function of the JLD612, and walk away. It will figure out how to control the temperature on its own. Four Sous Vide and any type of electric heating element, the accuracy is surprising – it will hold temperature to within .1 degree F with no trouble at all. For something like a smoker that has varying amounts of fuel, it does a great job from temperatures becoming too cold when you are low on fuel, but be very careful about adding too much wood or charcoal. I am very familiar with my smoker and know how much it needs, but you can easily overdo it and have a fire much hotter than you desire. 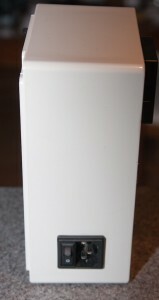 Remember, this device (as-is built in this post) can only add heat, it cannot remove it. If you want to get fancy with alarm outputs, you could definitely use this controller to trigger some sort of contraption to clear heat out of a smoker if need be. The results.. see for yourself! !